Karuna (Caroline Ashley) is the founder of Light On Kundalini, an online resource for all things Kundalini. She facilitates certified Level One teacher trainings and Advanced Level Two teacher training modules through the Kundalini Research Institute. Karuna teaches daily group yoga classes and private lessons in Boulder, CO, leads weekend intensives on varying themes, and facilitates retreats internationally. In addition, Karuna offers guided health cleanses, and organizes special events featuring world-renowned Kundalini Yoga teachers, artists and musicians. Karuna continued to find more of herself as she studied Hinduism, Buddhism, and the Lakota Sioux healing tradition. As her exploration of spiritual practices continued to deepen, she attended a Kundalini yoga class in Los Angeles taught by Gurmukh Kaur Khalsa. Karuna was immediately captivated by this amazing technology—unlike any other yoga she had experienced—in which posture, breath, mantra and meditation blend into a rich whole. Today, Karuna shares Yogi Bhajan’s treasured Kunalini yoga teaching with students all over the world. True to her spiritual name, which means “compassion,” Karuna likens herself to a coach, helping her students push beyond self-imposed limits. Her classes are filled with humor, music and the spirit of transformation. 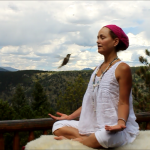 She brings her own unique brand of compassion, enthusiasm and pure joy to every Kundalini Yoga practice. Since 2014 Karuna has also been traveling internationally sharing in lifestyle, happiness and well-being related programs associated with the global Happiness Initiative, the UN NGO Forum 21 Institute, and the emerging Interspiritual Movement. What is Kundalini Yoga All About? from Caroline Ashley on Vimeo.